A new study published in the Canadian Journal of Cardiology determined that patients with acute cardiac syndrome (ACS) and cardiogenic shock (CS), who live far from the only cardiac catheterization facility in Nova Scotia, Canada, have a survival rate about half that of patients with more direct access. ACS includes various forms of acute myocardial infarction (“heart attacks”) and is a major medical emergency. CS is one of the most serious complications and leading causes of mortality among patients hospitalized with ACS. Both conditions require immediate treatment and invasive cardiac care. The optimal management of patients with ACS usually requires access to invasive coronary diagnostic and intervention such as percutaneous coronary interventions (PCI) to open up blocked arteries. The only institution capable of providing invasive cardiac catheterization for PCI and coronary artery bypass surgery in Nova Scotia is the Queen Elizabeth II Health Sciences Centre (QEII-HSC) in Halifax. This study evaluated whether the distances involved in getting patients to QEII-HSC affect survival rates. Using data from the clinical database of Cardiovascular Health Nova Scotia, 418 consecutive patients diagnosed with ACS and CS and admitted to hospital in 2009-2013 were included. Of these, 309 (73.9 percent) were close to or directly admitted to QEII-HSC and were classified as having direct access to invasive care. Of the 109 patients in other parts of the province, 64.2 percent were transferred to QEII-HSC. The mortality rate among the 309 patients with direct access to invasive care was significantly lower than the 109 patients who did not have access (41.7 percent vs. 83.5 percent, p <0.0001). Unadjusted mortality was lowest among patients undergoing primary percutaneous coronary intervention (33.1 percent). After adjustment for clinical differences, direct access to cardiac catheterization remained an independent predictor of survival. 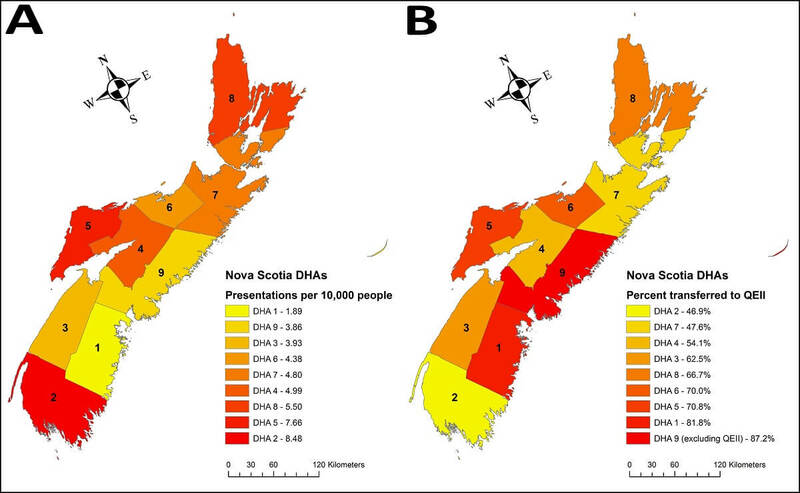 When comparing patients presenting with ACS + CS relative to the population in each of the nine separate District Health Authorities (DHA) in Nova Scotia, investigators identified regions with a greater than four-fold difference from the highest to lowest incidence, with the DHAs at the geographic extremes from Halifax having the highest incidence (see maps in Figure). They also determined that the percentage of cases resulting in transfer to QEII-HSC from each DHA ranged from about 47 percent (DHA 2) to about 87 percent (DHA 9, including QEII-HSC). This almost two-fold difference in transfer rates was congruent with the areas of highest incidence. Incidence of A) patients admitted to hospital with ACS complicated by cardiogenic shock relative to the population of that district health authority (DHA) and B) patients transferred to the QEII-HSC relative to cases presenting in that DHA. The investigators note that during the five-year study period, the incidence of ACS complicated by CS was 2.9 percent, which is lower than the 6.3 percent previously found in Nova Scotia, and which follows a global trend of decreasing incidence of CS. They also found that the overall mortality rate for ACS + CS patients decreased to 52.6 percent versus the previously reported 60.1 percent. Nevertheless, the marked disparities across the Province point to areas for improvement. The article is “Where you live in Nova Scotia can significantly impact your access to life saving cardiac care: Access to invasive care influences survival,” by John Colin Boyd, MSc; Jafna L Cox, MD, FRCPC; Ansar Hassan, MD, FRCSC; Sohrab Lutchmedial, MD, FRCPC; Alexandra M. Yip, MSc; Jean-François Légaré, MD, FRCSC (https://doi.org/10.1016/j.cjca.2017.11.021). It appears in the Canadian Journal of Cardiology, volume 34, issue 2 (February 2018) published by Elsevier. Full text of this article is available to credentialed journalists upon request. Contact Eileen Leahy at +1 732-238-3628or cjcmedia@elsevier.com to obtain copies. Journalists wishing to schedule interviews with the authors should contact Dr Jean-Francois Légaré at +1 506-648-6102 or legarej@me.com. Editor-in-Chief Stanley Nattel, MD, is Paul-David Chair in Cardiovascular Electrophysiology and Professor of Medicine at the University of Montreal and Director of the Electrophysiology Research Program at the Montreal Heart Institute Research Center. The Canadian Cardiovascular Society is the professional association for Canadian cardiovascular clinicians and scientists working to promote cardiovascular health and care through knowledge translation, professional development, and leadership in health policy. The CCS provides programs and services to its 2000+ members and others in the cardiovascular community, including guidelines for cardiovascular care, the annual Canadian Cardiovascular Congress, and, with the Canadian Cardiovascular Society Academy, programs for trainees. More information about the CCS and its activities can be found at www.ccs.ca.